Reading and share top 15 famous quotes and sayings about Nightingales by famous authors and people. 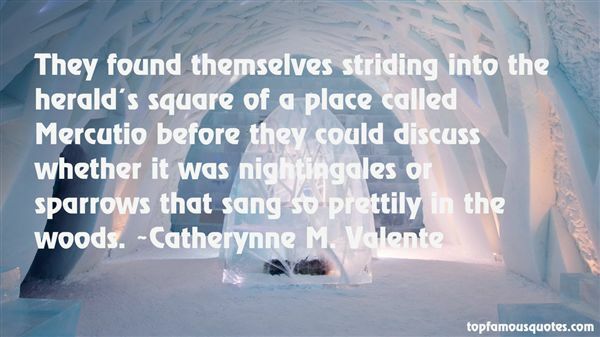 Browse top 15 famous quotes and sayings about Nightingales by most favorite authors. 1. "Poetry is a rich, full-bodied whistle, cracked ice crunching in pails, the night that numbs the leaf, the duel of two nightingales, the sweet pea that has run wild, Creation's tears in shoulder blades." 2. "They found themselves striding into the herald's square of a place called Mercutio before they could discuss whether it was nightingales or sparrows that sang so prettily in the woods." 3. "When I am dead, my dearest,Sing no sad songs for me;Plant thou no roses at my head,Nor shady cypress tree:Be the green grass above meWith showers and dewdrops wet:And if thou wilt, remember,And if thou wilt, forget.I shall not see the shadows,I shall not feel the rain;I shall not hear the nightingaleSing on as if in pain:And dreaming through the twilightThat doth not rise nor set,Haply I may remember,And haply I may forget." 4. "In my craft or sullen artExercised in the still nightWhen only the moon ragesAnd the lovers lie abedWith all their griefs in their arms,I labour by singing lightNot for ambition or breadOr the strut and trade of charmsOn the ivory stagesBut for the common wagesOf their most secret heart.Not for the proud man apartFrom the raging moon I writeOn these spindrift pagesNor for the towering deadWith their nightingales and psalmsBut for the lovers, their armsRound the griefs of the ages,Who pay no praise or wagesNor heed my craft or art." 5. 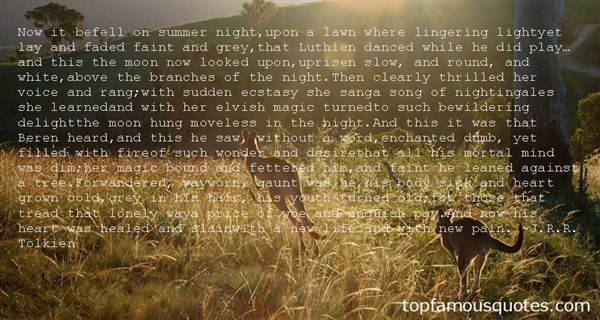 "Now it befell on summer night,upon a lawn where lingering lightyet lay and faded faint and grey,that Luthien danced while he did play…and this the moon now looked upon,uprisen slow, and round, and white,above the branches of the night.Then clearly thrilled her voice and rang;with sudden ecstasy she sanga song of nightingales she learnedand with her elvish magic turnedto such bewildering delightthe moon hung moveless in the night.And this it was that Beren heard,and this he saw, without a word,enchanted dumb, yet filled with fireof such wonder and desirethat all his mortal mind was dim;her magic bound and fettered him,and faint he leaned against a tree.Forwandered, wayworn, gaunt was he,his body sick and heart grown cold,grey in his hair, his youth turned old;for those that tread that lonely waya price of woe and anguish pay.And now his heart was healed and slainwith a new life and with new pain." 6. "His voice was cloves and nightingales, it took us to spice markets in the Celebs, we drifted with him on a houseboat beyond the Coral Sea. We were like cobras following a reed flute." 7. "Somewhere there are gardens where peacocks sing like nightingales, somewhere there are caravans of separated lovers traveling to meet each other; there are ruby fires on distant mountains, and blue comets that come in spring like sapphires in the black sky. If this is not so, meet me in the shameful yard, and we will plant a gallows tree, and swing like sad pendulums, never once touching." 8. "Haunting the library as a kid, reading poetry books when I was not reading bird books, I had been astonished at how often birds were mentioned in British poetry. Songsters like nightingales and Sky Larks appeared in literally dozens of works, going back beyond Shakespeare, back beyond Chaucer. 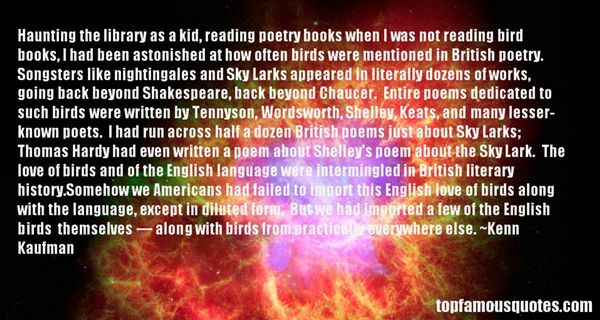 Entire poems dedicated to such birds were written by Tennyson, Wordsworth, Shelley, Keats, and many lesser-known poets. I had run across half a dozen British poems just about Sky Larks; Thomas Hardy had even written a poem about Shelley's poem about the Sky Lark. The love of birds and of the English language were intermingled in British literary history.Somehow we Americans had failed to import this English love of birds along with the language, except in diluted form. But we had imported a few of the English birds themselves — along with birds from practically everywhere else." 9. "Elvis Presley once said that I don't know anything about the music. It is because he is the music itself! The nightingales don't know anything about the music!" 10. "Be motivated like the falcon,hunt gloriously.Be magnificent as the leopard,fight to win.Spend less time withnightingales and peacocks.One is all talk,the other only color." 11. "I have a million nightingales on the branches of my heart singing freedom. "(A Million Nightingales)"
12. "Hah!" said Granny Weatherwax. "I should just say it is a folk song! I knows all about folk songs. Hah! You think you're listenin' to a nice song about...cuckoos and fiddlers and nightingales and whatnot, and then it turns out to be about...something else entirely," she added darkly." 13. "No guinea of earned money should go to rebuilding the college on the old plan just as certainly none could be spent upon building a college upon a new plan: therefore the guinea should be earmarked "Rags. Petrol. Matches." And this note should be attached to it. "Take this guinea and with it burn the college to the ground. Set fire to the old hypocrisies. Let the light of the burning building scare the nightingales and incarnadine the willows. And let the daughters of educated men dance round the fire and heap armful upon armful of dead leaves upon the flames. And let their mothers lean from the upper windows and cry, "Let it blaze! Let it blaze! For we have done with this 'education!" 14. "Formerly I believed books were made like this: a poet came, lightly opened his lips, and the inspired fool burst into song – if you please! But it seems, before they can launch a song, poets must tramp for days with callused feet, and the sluggish fish of the imagination flounders softly in the slush of the heart. And while, with twittering rhymes, they boil a broth of loves and nightingales, the tongueless street merely writhes for lack of something to shout or say"
15. "Most of us live for the critic, and he lives on us. He doesn't sacrifice himself. He gets so much a line for writing a criticism. If the birds should read the newspapers, they would all take to changing their notes. The parrots would exchange with the nightingales, and what a farce it would be!" Soy una victima en mi propia guerra."